The Kimono was developed in Japan starting in the early 10th Century, when the Ancient Chinese styles were supplanted by the now common kimono style. This was derived from native work garments which better suited the climate, lifestyles and aesthetics of the Japanese, This was the late Heian or Fugiwara, period (897-1185). 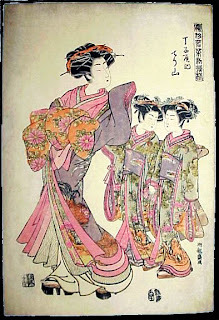 The earliest form of the kimono is the Kosode (small sleeve garment). Originally, it was a generally worn, plain undergarment. The farmers, crafters & merchant class continued to wear their simple two-piece garments: the Happi, a knee length top tied at the waist and loose trousers just below the knee. This was common to both sexes. Women could also wear a mid-calf, wrap-around, pleated skirt, the Mo. During the Heian period, the men of the nobility and imperial household retained some of the ceremonial styles of China, wearing the kosode as an undergarment- Kariginu. 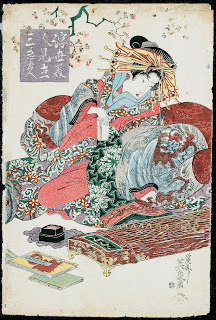 The women embraced the kimono of the large, open sleeves, the Osede. 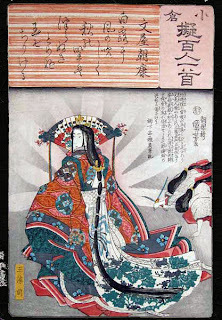 This was the era of the 12-layer kimono, (Juni-hito) worn at court. They were unlined, with wide sleeves. Care was taken that the layers blended, matched & contrasted in an aesthetically pleasing manner. The layers were visible at the neck, sleeves and the lower skirts. Up to 20 layers could be worn. Underneath it all was a kosode and Hakama, long pleated pants. The layers were tied with sashes. The lady's garments became very simple. The basic kosode sleeve had a small opening and less fabric hanging down. This was worn with hakama, the hem varying from just to the floor to dragging, depending on the occasion. 1338-1568 was the Muromachi period. This is when the tea ceremony and Noh drama were developed, along with other flowerings of artist expression. The samurai austere warrior's code had them distance themselves from the clothing of the court by wearing subdued fabrics. The men's robes were very similar to the hitatare, but were made of linen, not silk, with cords of leather, not braided silk. This was the Daimon. This garment often had the family crest (kamon) in 5 places on the kimono- 2 at the shoulders in front, 2 on the sleeves and 1 at the neck, in the back. There was no other decoration, only the fine woven patterns of the fabric. The lady's kosode was the standard for all women, but for formal activities, an over kimono (Uchikake) was worn with the kosode under the hakama. The uchikake had longer sleeves with a small sleeve opening. In summer, the uchikake was allowed to drape over the ties of the hakama and trail behind. This could also be worn with extra-long hakama (Koshi-maki style). During the Momoyama period (1573- 1603), warriors and land owners assumed positions of authority. This caused a change of attitude toward fashion. What ever was new and novel was highly valued. 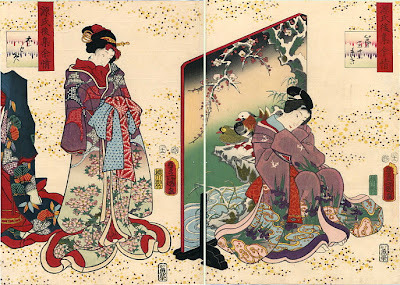 The women of the daimyo families wore richer and more elaborately decorated kimono. The ceremonial kosode and uchikaki, with a sash obi, became the standard. After 1603, the Tokugawa shogunate was in control. The capital was at Edo, now called Tokyo. The island was closed to outsiders, except for a few Dutch and Chinese merchants at the port of Nagasaki. In men's fashion, they added the wing-shaped Kamishimo to the kimono and hakama for ceremonial attire. A formal occasion would require long, dragging hakama. The women's styles also continued to evolve as the sleeves became much longer. 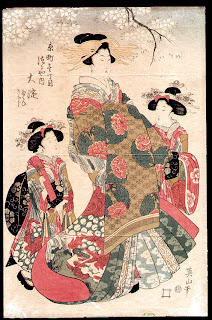 Fashion was influenced by the Kabuki actors and courtesans. A style of obi was a long, braided silk cord with tasseled ends. This was wrapped around the waist and tied in back, so as to not detract from the elaborate, colorful kimono. 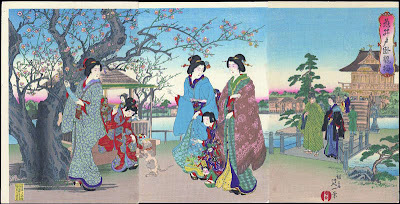 Later in the Edo period (1680- 1700's), the sleeves were at their longest- the Furisode style. The long sleeves were often used for flirting, so this style was worn by unmarried women and of course, courtesans and geisha. With the furisode was worn a much wider, stiff obi, tied in an elaborate bow in the back. This was the Darari-musubi. The samurai ladies would also still wear the plainer styles encouraged by the samurai code. The obi itself became a design element, wider and heavier than before. During the middle of the Edo period, the obi developed its' now traditional size of 3.6m in length by 26.8cm. width. 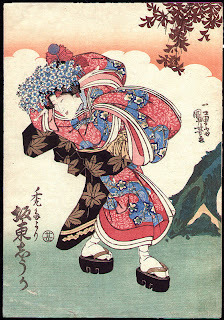 During this time, obi were often tied in front or back, with different tying styles coming from Kabuki actors. Men's obi were in two styles-- Kaku obi, which is stiff and the Heko obi, which is soft. Traditional fabrics for kimono are silk, linen, cotton and wool. Patterns are produced by many methods: weaving (hand or machine), hand-painted, stencil & tie- dyeing, embroidery or combinations of techniques. All are period methods. Common dye colors were yellow, brown, black, blues, red and green. In period, white was reserved for undergarments and burial clothing. Modern western influence has changed that tradition. The older patterns from Japan include cross, parallel cross, check, plaid, stripe, diamond, dots, dashes, and squares. Stenciled and block printed patterns often reflect nature: tortoise shell, clouds, blossoms, pine needles, mums, crane, water, mountains, bamboo, leaves, insects, birds, land & sea animals. Other designs: fans, comb, yin-yang, spiral, feather, tied ribbons, etc. Check various Japanese picture prints and other artwork for more designs. The mini- series- Shogun, has lots of info for garb of the early 1600's. The Yukata is an unlined cotton kimono originally worn after bathing. It became a garment for casual home wear, especially during the humid summer months. The colors are usually a dark blue and white pattern. A simple sash obi is wore with this style. Another summer kimono is the Jofu, made of lightweight linen. This is worn with a light cotton kosode and an open-weave silk obi. Japanese kimono fabrics are about 13"-15" wide, some can be 28" wide. Standard fabric of 44" can be used, but the pattern layout has to be adjusted. A kimono is traditional hand- sewn to make it easier to clean. A simple set of running stitches is all that's needed. 1. The Book of Kimono- Norio Yumanaka, c1982, Kodansha International Ltd. 2. Folkwear Patterns- # 113- Kimono, cI977,1982, #151-Hakama & Kataginu, c 2003, Taunton Press. 3. Japan: National Costume Reference, Marion Sichel, c1987, Chelsea House Publ. 4. Make Your Own Japanese Clothes- John Marshall, c 1988, Kodansha 1 International Ltd.
oh i was reading this with croissant and tea and imagining how this all must look like but on the way my brain got lost, for it looks so intricated, but yet also so poetic, all those patterns. I think I must get myself some kimono. I like that diligence with whom it must be worn and the patterns and all the little details. Thank you so much for this entry. i was really glad to find that article, but honestly, i couldn't follow it myself. in the pdf version there are drawings that are numbered with little numbers in the text.